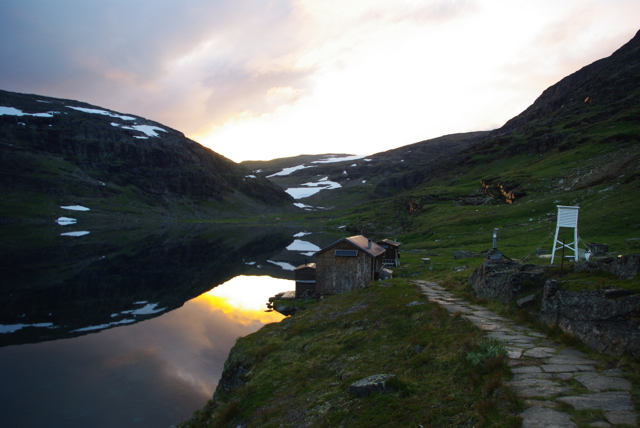 research – on my way: make it someday. In part one of my writeup on survey results, I talked a lot about the file drawer effect and why we end up not publishing some potentially useful results because we don’t have time. In a high-pressure environment where publication in the best journals is important to advance our careers, we often focus that limited time on the manuscripts with the highest potential impact. In some unfortunate cases, that means that professors do not prioritize giving their students the support necessary to publish results from projects, theses, or dissertations. There’s no doubt that this can hurt younger scientists’ careers. Helping a student aim high and write higher-quality papers is great…. but it can go too far, too. Today I will talk about something more insidious: when you are discouraged from publishing something for other reasons, like politics, that your data didn’t support your research group’s hypothesis, or that external partners did not understand the results or the underlying science. As an ecologist, I didn’t think that this happened a lot in our field, at least not compared to other fields where there’s more often commercial connections and money at stake. Perhaps if you are an environmental consultant or doing impact reports for the government or companies. But in a purely academic community I assumed that it was a fairly rare occurrence for results to be kept out of publication. One thing quickly became obvious. It does happen, sometimes. There are lots of reasons, some of which are highly case-specific, i.e. the government of the researcher’s native country didn’t allow him/her to import her samples in the end, after all…. but there are some common patterns, too. With such a small sample size – 40 of the 184 respondents reported this happening – and also the fact that I made it clear online that I really wanted to hear from people who had been discouraged from publishing, it’s impossible to say how prevalent such events actually are. The proportion of responses does not reflect the proportion of total scientists who have had this experience. I can certainly say that comparatively, many fewer unpublished papers are due to these events than due to the self-created file drawer effect. Two thirds of survey respondents said they had at least one unpublished dataset, if not a handful or more, even though many were just in the first five years of their research careers. The file drawer effect means that there are tens of thousands of unpublished datasets out there, maybe 100,000. Many probably have no significant results, since some of the most cited reasons for not publishing were inconclusive data, needing to collect more data, and doubting that the results would be accepted by a high impact journal. Other pressures happen in a smaller number of cases, but primarily for the opposite reason: results did show something interesting, but maybe not what someone – a supervisor or a government employee – wanted to see. And while I cannot draw any conclusions about prevalence, I can (hopefully) draw some conclusions about why this happens and who it happens to. Second, government and, to a lesser extent, industry challenges. Third, “internal” and interpersonal political challenges. Mostly students. One explanation is that as we go along in our careers, we get a better concept of what is good and valuable science, and make some of the decisions to jettison a project ourselves rather than being told by a supervisor. We also become more and more crunched for time, meaning that we make more of these types of prioritizations before it gets to the point of having someone else weigh in. But that’s not the only explanation. Let’s look first at when a direct supervisor was involved. With 32 responses of this type, it was about twice as common in my dataset than when an external person pressured a respondent not to publish. 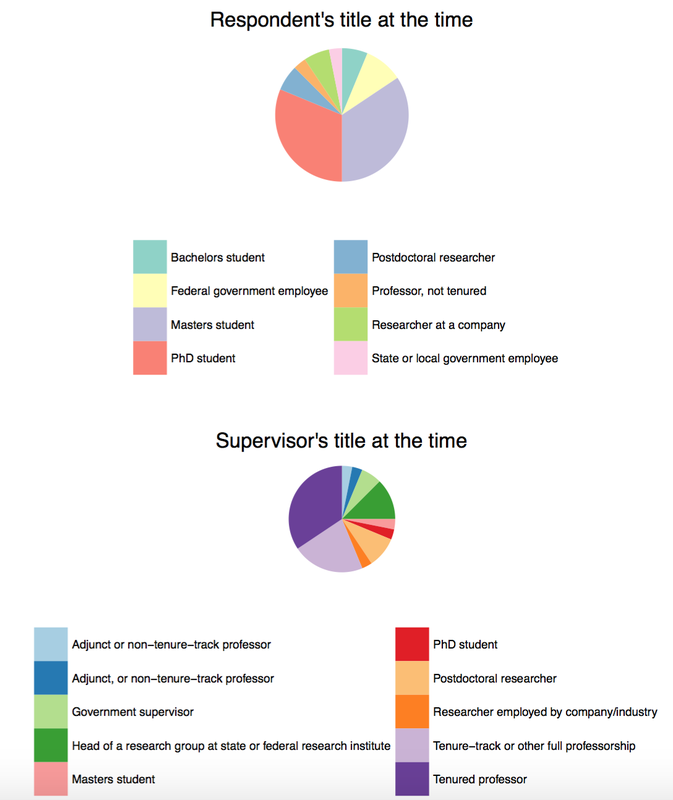 In these supervisor-related cases, it was most frequently a tenured or tenure-track professor discouraging a graduate student from publishing a chapter of their thesis or dissertation. And as discussed in part one, part of the issue was that these driven supervisors were strapped for time and transferred their own expectations about significance of results and journal quality onto their students, even if students would have been happy settling for a lower-impact publication. Sometimes this is very appropriate, sometimes less so. Where this line is drawn probably depends on your goals in science. Another respondent had a similar story with a different ending, about work done as part of a masters thesis. You can see both sides of the coin in some cases. What is the goal? To advance scientific theory and knowledge, or to share system-specific data that might help someone in the future? Ideally, a manuscript does both, but sometimes that’s not possible and just the second is still a good aim. In some cases the supervisor is probably guiding the student towards using their data to address some question larger than the one they had initially considered. But, as the bachelors thesis respondent noted, it’s not always appropriate to do so – some people think that overreaching and drawing conclusions based on data not really designed to do so is a big problem in some fields. A surprising amount of the time, supervisors discouraged students from publishing because the results turned out to not support their hypothesis. 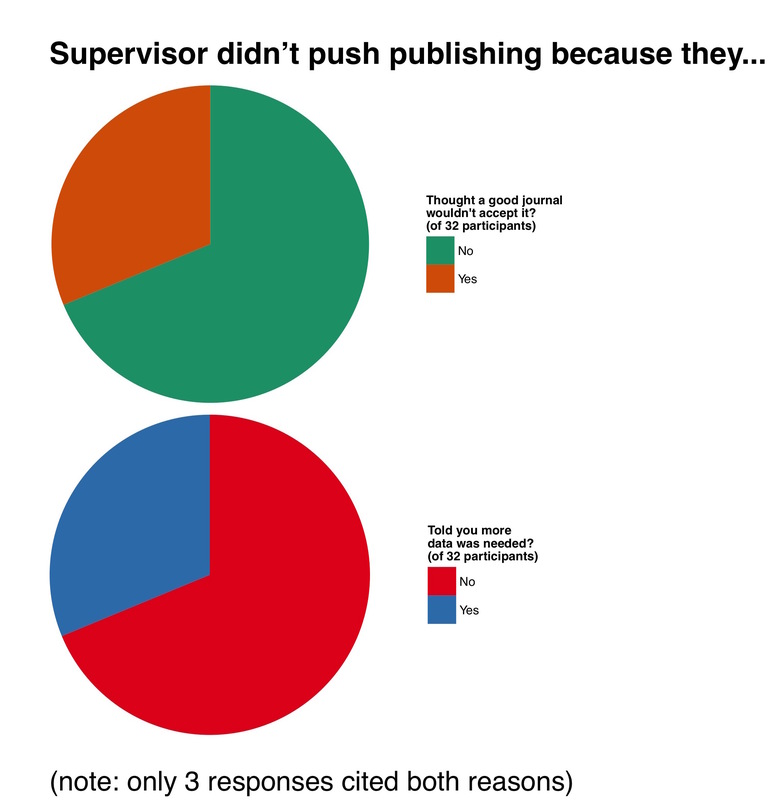 This was actually the most common single reason that a supervisor told a student not to publish. I may be naive, but it’s hard for me to think of a situation in which this is not just straight-up bad. 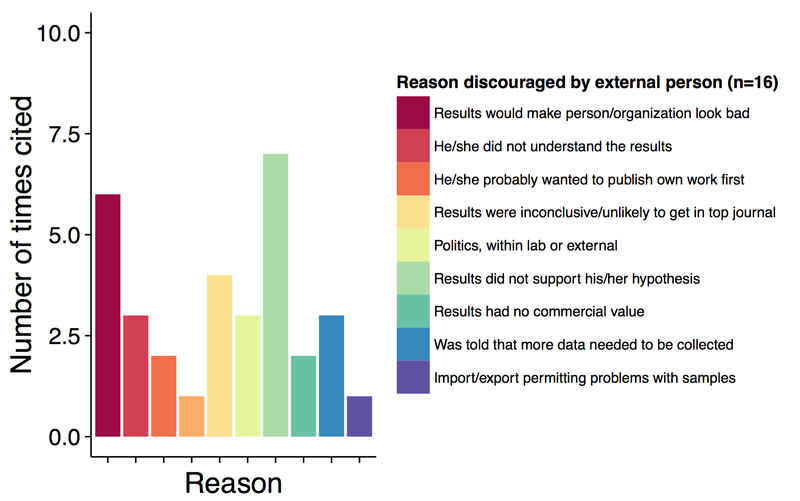 I was quite explicit to ask whether the results did not support “our” hypothesis, or whether they did not support a supervisor, department, or company’s hypothesis. Sometimes the two overlapped, but most of the time when this happened the respondent selected the second option: the researcher themself might not have been surprised by the results, but the supervisor, lab group, or company did not like them. This really surprised me. 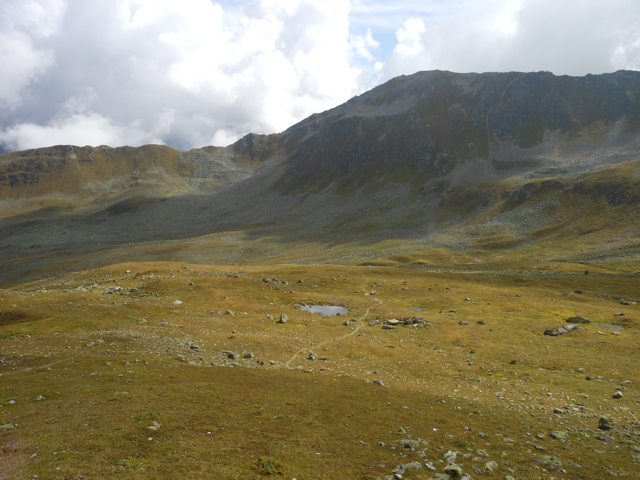 In our training as scientists it is drilled into us that we might learn as much from a null result or a reversal of our hypothesis as we would if our hypothesis was supported – maybe even more, because it tells us that we have to carefully look at our assumptions and logic, and can lead us down new and more innovative paths. In the U.S. at least, a substantial proportion of the population just has no respect for science. Whether its climate change deniers or anti-vaxxers, as a science community we tell them: go ahead, prove us wrong! Science is very open to accepting data that disproves something we had previously thought was true. We try to tell the public that we are not close-minded, that we are following evidence, and that if the evidence showed us something else, we’d still accept it. On some small scale, that might not be true, and it’s very troubling. Without knowing more about the research in question here, it’s impossible to say much more. But it’s not a very inspiring trend. And again: this was happening coming from direct supervisors who were mostly in academia and shouldn’t have had a financial or political conflict of interest or anything like that. And it also has potentially big implications for the sum of our community’s knowledge. Luckily there are so many researchers out there that probably someone else will ask the same question and publish it eventually, but this sort of attitude can delay learning important and valuable things. When pressure came from an external source – someone not supervising the study respondent – the prevalence of this reason for discouraging publication was even higher. The data not supporting someone’s hypothesis rose from roughly two-thirds of respondents citing it, to almost half. And relatedly, the person doing the pressuring was afraid that the results would make them, their group, or the government look bad. In other words, these are classic cases of repressing research, the worst case scenario that we think of! Sometimes, this external pressure came from within academia, but it was also often from governments. It’s clear that one place where state, local, and federal government officials can be particularly destructive is Canada. Apart from the cuts to research funding which have been hitting many countries, it’s been discussed by people far more knowledgeable than I that the government literally muzzles its scientists by not allowing them to talk to the media, among other policies: see here, here, and here. 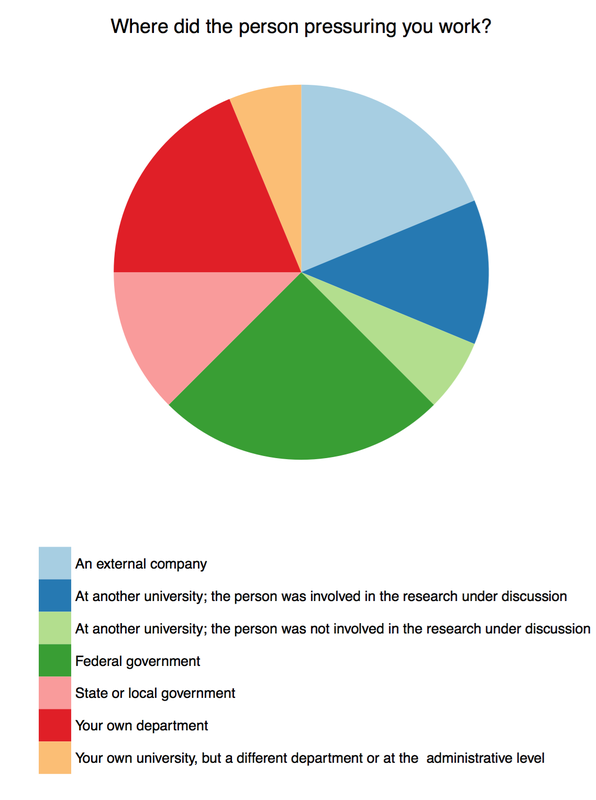 Multiple survey respondents cited the Canadian government. So, about those elections coming up…. Consultants and researchers in the corporate/industrial sectors are often muzzled as well, but many of them are aware of this from the time they are hired. But even if companies are upfront about data ownership policies, it can still feel tough. One person told me that it was discouraging not to be able to get a patent and get credit for his/her work because a company owned all the intellectual property rights and would use the discovery as proprietary and secret until it was no longer profitable to do so. 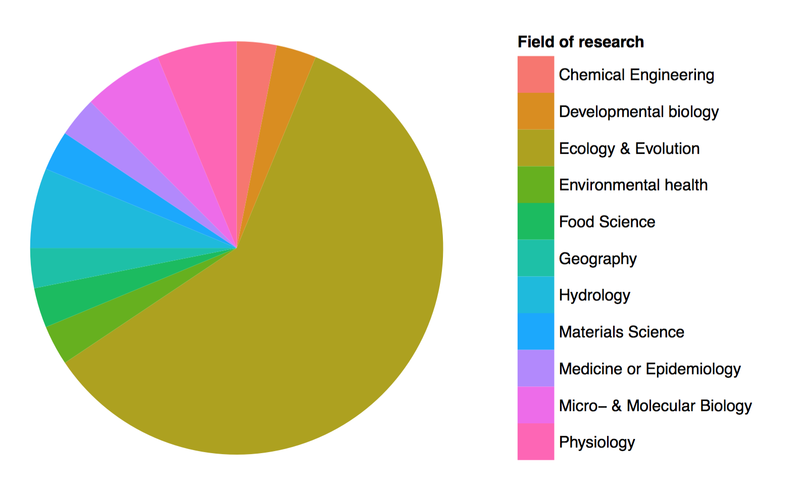 In a variety of fields, there’s also some crossover between the industrial and academic sectors of research. Companies often provide funding to students or research groups working in an essential location or on a related topic. The companies shouldn’t be able to use their influence to suppress results, but in some cases they do seem to. This is actually what happened in the case that inspired me to create my survey: the International Association of Athletics Federations squashed survey results showing that a huge proportion of championships competitors were doping. They were not involved in the research itself, but had provide access to the athletes, and thus felt like it was their prerogative to police the results. One survey respondent said that he had been let go from his position after publishing research about the effects of pesticides, and had heard a researcher with industry ties imply that the same thing would happen to someone else publishing similar research. Several people in environmental and earth sciences fields mentioned this happening to people that they knew or had talked to, but it’s hard to pin down other than in news stories. Finally, other politics are more about internal power dynamics, be it within a department or within a research field. It’s pretty tragic to see a good experiment, or maybe a whole grant that some agency spent hundreds of thousands of dollars on and researchers spent years of their lives on, get derailed by interpersonal problems and arguments about data ownership or authorship. In many fields the community of specific experts is fairly small, so you are likely to have to work with people again, or have them review papers, etc etc etc. The problems are hard to resolve once they begin. It was also clear that sometimes people nixed manuscripts because they didn’t understand the science or the value of this. Sometimes this meant a bureaucrat at a funding agency, but sadly, sometimes it also came from within the scientific community itself. “Because my scientific community is so small, in some cases only one review has been given by a local expert, and of course the editors don’t have time to fact-check, but my paper will not be accepted because these few experts are, as I perceive it, not wanting recent data contrary to results from their systems to be published, and assume that someone with an M.Sc. cannot be a diligent scientist, in many cases providing lots of evidence in reviews that they have not read the manuscript with care… possible skipping entire sections,” wrote one student. There’s even outright theft sometimes. This has been, in some ways, a worst-ever tour of the scientific research community. We all know someone who has had some terrible experience with their research. But many of us have had relatively happy tenures in science and research. 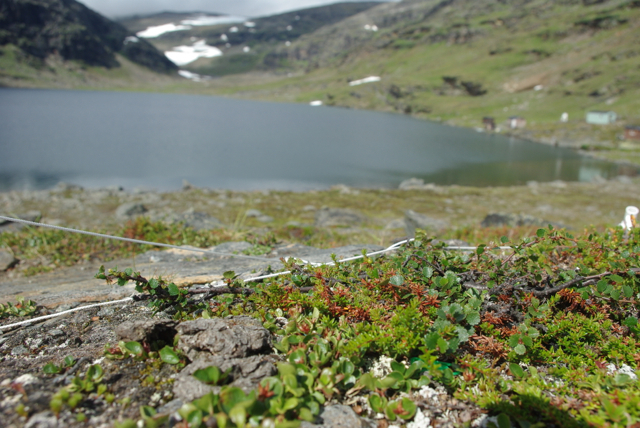 At least in my field, ecology, I can say that the vast majority of people are good people and fun to work with. It’s part of what I love about my job. If the only people around me were those who stole results, bullied me into not publishing, constantly asked me to change the focus of my research, or demeaned what I did because I was a graduate student, I would quit. But here I am, and I’m happy! Such people do not make up the majority in our fields. But it’s worth remembering that even one major interaction like this can seriously discourage people from continuing to do research. 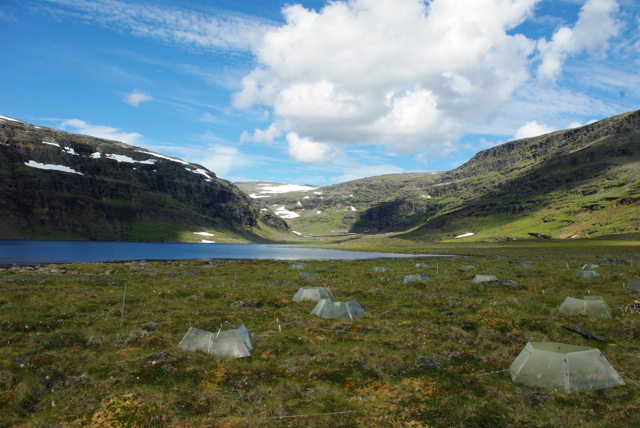 There are lots of other jobs out there, and if the research environment is malevolent it’s easy to feel that the grass is greener on the other side. So: with the knowledge that there is some scummy behavior going on, can we try to be nicer and kinder to one another? After all, our goals are to advance scientific knowledge and to create more capable, creative, and conscientious scientists. Thanks to all who participated in the survey. I hope it has been interesting and helpful to read about. the contagion of perfectionism & the scientific publication bias. A few weeks ago I sent out a survey to many of my scientist friends. I wanted to know: why does some research stay unpublished? 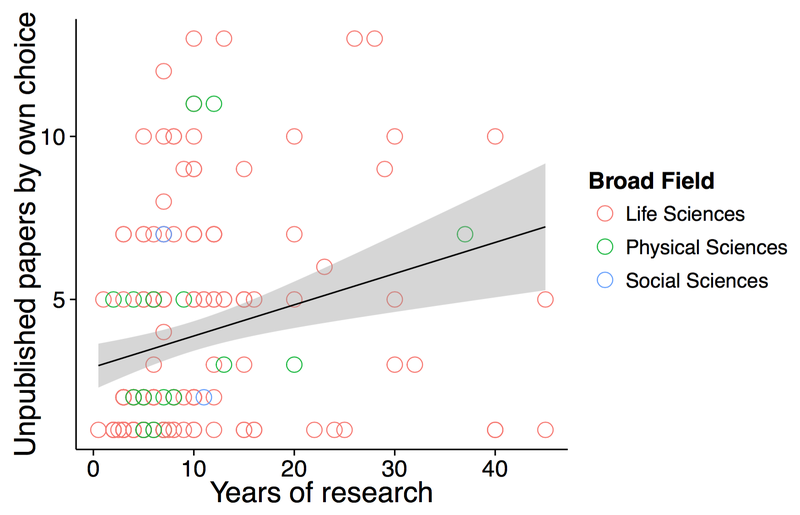 Those outside academia or research might think that science always proceeds in a linear fashion. A person does a study, they publish it, now it is out there for other scientists to reference. Once research is performed, it is a known quantity. But that’s not necessarily true. For any number of reasons, a fair chunk of research never makes it to the publication stage. Sometimes it’s because it’s bad research: it is biased or the methods are bad, so during the peer review process the paper is rejected. This might not be through any real fault of the scientists. The problems might have only become apparent after the research was completed. This is pretty inevitable, and can lead a research group to design a second study that is much better and really gets at their question. But does all the good research even get published? No, definitely not. There’s research out there that remains unpublished even though it probably could have been. Some possible reasons for this are that the researchers ran out of time to write up the results, or the results just didn’t seem very interesting, or their hypothesis was rejected. For these reasons people might choose to focus on another project they had going at the same time. But that leaves a gap in the record of published science: results with bigger effect sizes are published proportionally more often than null results. Results with no effect might be left in a drawer to be published later, or never. This phenomena is called the “file drawer effect” and is a major contribution to a bias in publication which is problematic for many reasons, which I’ll discuss later. Here’s a nice paper on the file drawer effect. With my survey, I wanted to get at why people don’t publish. First I asked about how much research they leave in the file drawer, so to speak, out of their own choice. Then I asked how often other people pressured them to avoid publishing, and why. I’ll get to that second question in part two of this post. First, as a caveat before getting to what people told me. The responses certainly don’t represent the whole science community, and I can’t draw any conclusions about frequency of the types of things I’m asking about. I had 182 responses, which is not a lot, and the majority were from ecologists and evolutionary biologists relatively early in their careers. The survey was spread by word of mouth so this is just a function of who I know. It’s obvious now that I could have worded this a little bit better. Some people include all of their unpublished work in this answer, while others said that just because something hadn’t been published yet didn’t mean that it would never be published, and left some work out of the count. They may be right about that: some work does eventually get published years later, when researchers finally have a chunk of free time and nothing “more important”. But that data that you swear you will write up one day can also remain in the file drawer indefinitely. 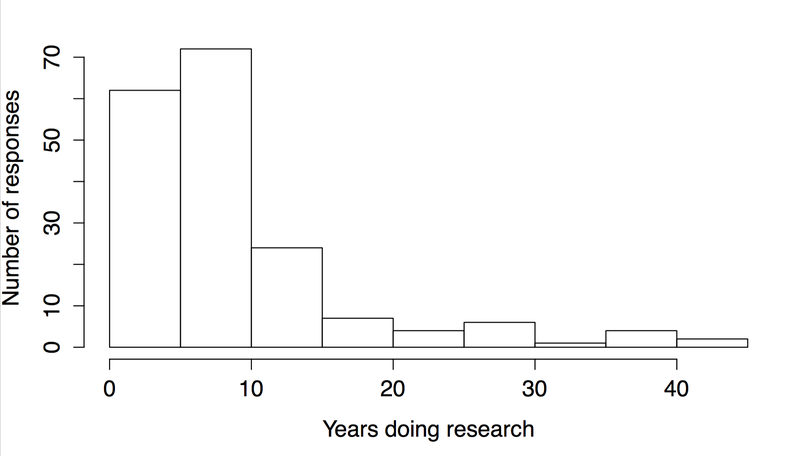 Adding a regression line is probably inappropriate here, but let’s just say that in the first ten years of their career (depending on how they are counting, this is a bachelors thesis, a masters, a PhD, and maybe a postdoc or two), many people accumulate four or five studies that they could have published, but they didn’t. After that they might accumulate one every five or ten years. It makes sense that more of the unpublished papers come early in the career because people aren’t yet adept or fast at writing papers. They also don’t have as much experience doing research, so data from projects like bachelors theses often go unpublished because of flaws in study design or data collection. These mistakes are what eventually lead us to learn to do better science, but they can keep a piece of research out of a top journal. The answers are partially biased, I am sure, by the differences in productivity and funding between different researchers. This might depend on what kind of appointment the researcher has – is their job guaranteed? – and how much funding they have. A bigger lab can generate a lot more results. But someone still needs to write them; labs might go through phases where the writing falls primarily on the PI (primary investigator, a.k.a. 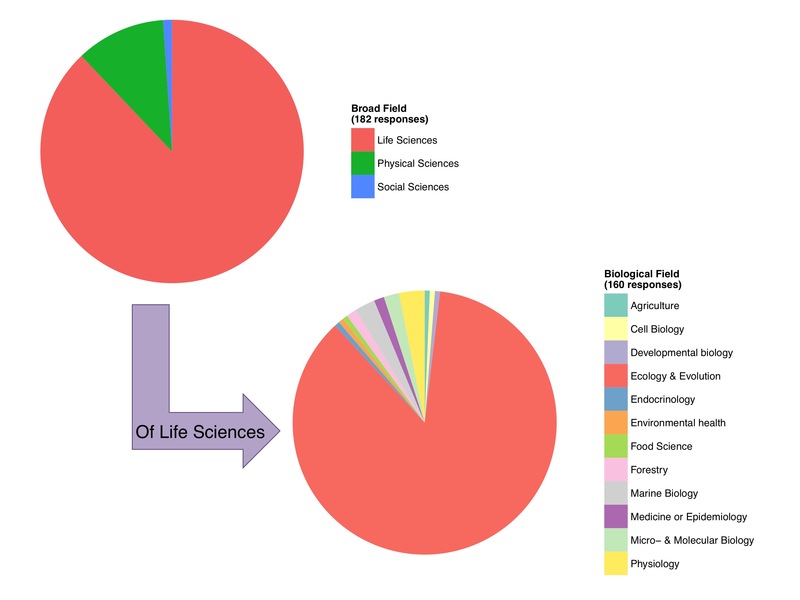 lab head) or other phases where there are highly productive postdocs or precocious PhD students who also get a lot of papers out the door. And one of the biggest constraints is, of course, time. With pressure to publish your best research in order to get that postdoc position, to be competitive for a tenure-track job, and to eventually get tenure, if researchers have to choose between publishing a high-impact paper and low-impact one they will certainly focus their energies on the high-impact results. The results that were confusing or didn’t seem to show much effect of whatever was being investigated might stay in that file drawer. One thing that was clear is that this problem of time as a limiting resource is contagious. Later, I asked people if they had ever been discouraged from publishing something which they had wanted to publish. Of the 32 cases where a supervisor discouraged publishing, two answers as to why emerged as particularly common. In some cases, the supervisor might be right. Maybe more data really was needed, maybe the experiment needed to be replicated to ensure the results were really true, maybe the team needed to do a follow-up experiment or correct some design flaws. After all, the supervisor should have more experience and be able to assess whether the research is really good science which will stand up to peer review. But at the same time: as Meghan Duffy recently noted on Dynamic Ecology, perfect is the enemy of good. That can go for writing an email to your lab, and also for doing experiments. In the discussions of her blog post, someone noted that “perfect is the enemy of DONE” and Jeremy Fox wrote that often graduate students can get into the rut of wanting to just add one more experiment to their thesis or dissertation, so that it is complete, but at some point you just have to stop. If more data should be collected, but probably never will be, does that mean that the whole study should sit in the file drawer? If it was done correctly, should it still be published so that other people can see the results, and maybe they can do the follow-up work? Different researchers might have different answers to this question depending on how possessive they are of data or an idea, or what level of publication they expect from themselves. But if a student, for example, is the primary person who did the research, their opinions should be taken into account too. Why is this publication gap a problem? That gets into the second idea: that as-is, the research won’t be accepted into a top journal. Ideally, this shouldn’t matter, if the research itself is sound. There are plenty of journals, some of them highly ranked, which accept articles based more on whether the science is good and the methods correct, rather than whether the results are groundbreaking. It is important to get well-done studies with null results out there in the world. Scientific knowledge is gathered in a stepwise fashion. Other scientists should know about null results, arguably just as much or more than they should know about significant results. We can’t move knowledge forward without also knowing when things don’t work or don’t have an effect. Here’s two quick examples. 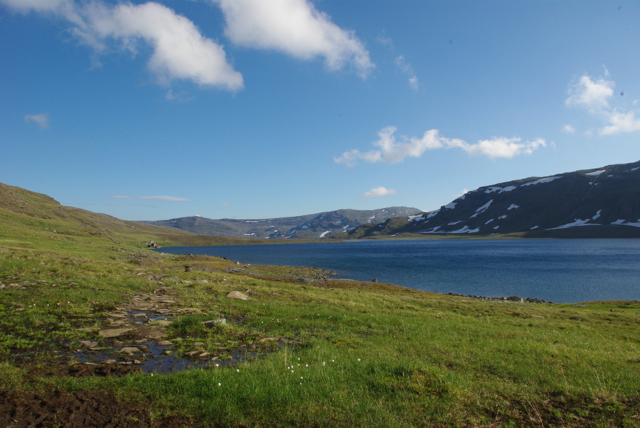 First, at least in ecology and evolution, we often rely on meta-analyses to tell us something about whether ideas and theories are correct, or, for example, how natural systems respond to climate change or pollution. The idea is to gather all of the studies that have been done on a particular topic, try to standardize the way the responses were measured, and then do some statistics to see whether, overall, there is a significant trend in the responses in one direction or another. (Or, to get a little bit more sophisticated, to see why different systems might respond in different ways to similar experiments.) This both provides a somewhat definitive answer to a question, and makes it so that we can track down all of the work on a topic in one place rather than each scientist having to scour the literature and try to find every study which might be relevant. If researchers only 20% of the scientists studying a question find a significant effect, but these are the only results which get published, then literature searches and meta-analyses will show that there is, indeed, a significant effect – even if actually, across all the studies which have been done (including the unpublished ones), it’s a wash. Scientific knowledge is hindered and confounded when this happens. Almost everyone in the scientific community acknowledges that the publication bias towards positive or significant results is problematic. But that doesn’t really solve the problem. It’s just a fact that null results are often much harder to publish, and much harder to get into a good journal. And considering the pressure that researchers are under to always shoot for the highest journals, so that they can secure funding and jobs and advance their careers, they are likely to continue neglecting the null results. This pressure can be so great that, I was told in a recent discussion, having publications in low-impact journals can actually detract from your CV, even if you have high-impact publications as well. Two candidates with the same number of Ecology Letters or American Naturalist or even Nature papers (those are good) might be evaluated differently if one of them has a lot of papers in minor regional or topic-specific journals mixed in. Thus, some researchers opt for “quality not quantity” and publish only infrequently, and only their best results. 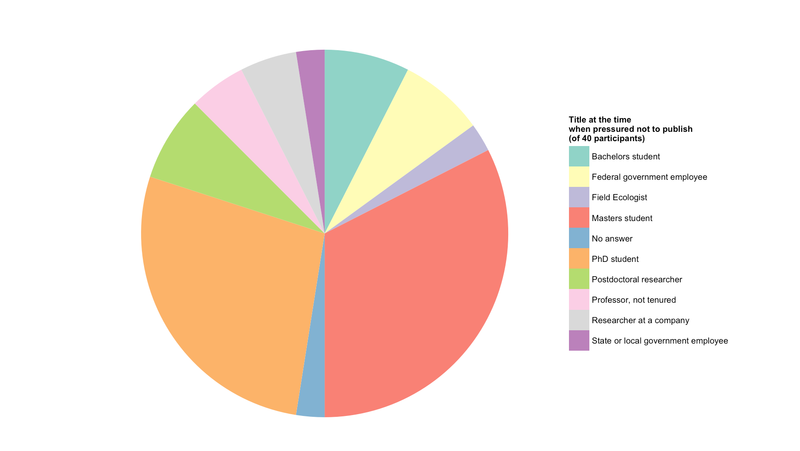 Others continue to publish datasets that they feel are valuable even if they know a search or tenure committee might not see that value, but consider leaving some things off their CV. One thing I’d like to mention here is that with the “contagion”, students are sometimes affected by their supervisors’ standards of journal quality. While a tenure-track supervisor may only consider a publication worthwhile if it’s in a top journal, a masters student may be greatly benefited by having any publication (well not any, but you see my point) on their CV when applying for PhD positions. I also know from my own experience that there is incredible value, as a student, in going through the publication process as the corresponding author: learning to write cover letters, respond to reviewer comments, prepare publication-quality figures, etc. Doing so at an early stage with a less-important manuscript might be highly beneficial when, a few years later, you have something with a lot of impact that you need to shepherd through the publication process. There are many good supervisors who balance these two competing needs: to get top publications for themselves, but to also do what is needed to help their students and employees who might be at very different career stages. In many cases, of course, supervisors are indeed the ones pushing a reluctant graduate to publish their results! Unfortunately, this is not always the case. Again, because of the low number and biased identity of survey participants I can’t say anything about how frequently supervisors hinder their students in publishing. But I think almost everyone has some friend who has experienced this, even if they haven’t themselves. That obviously feeds in to the publication bias. So how do we get past it, in the name of science? There aren’t a lot of answers. 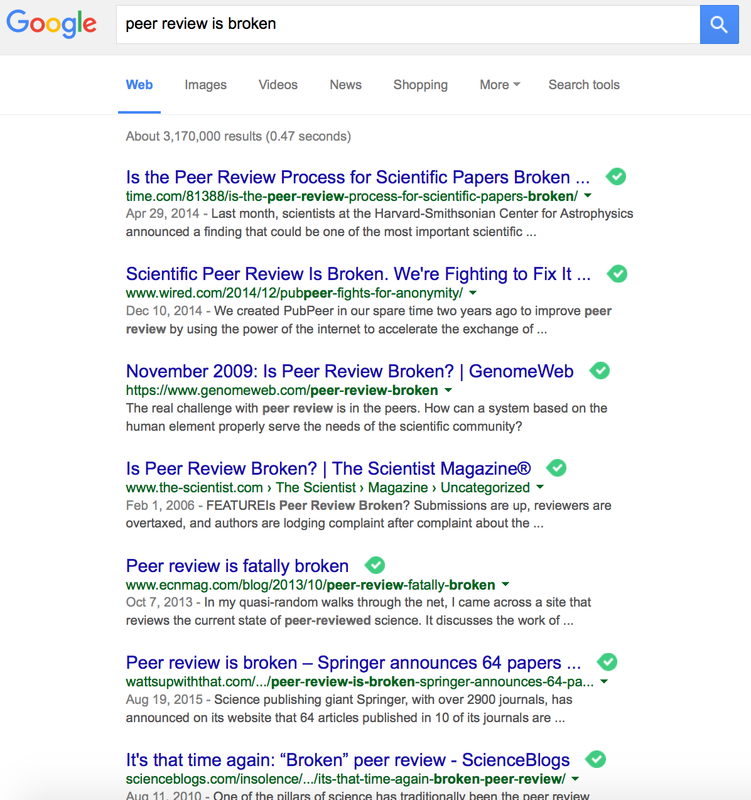 Why is the publication gap maybe not so bad? At the same time, it’s clear that if all this research (100,000 or more papers!) was submitted for publication there would be some additional problems. Scientific output is roughly doubling every nine years. There are more and more papers being published; there are more postdocs (although less tenure-track professor positions) in today’s scientific world, and I’m pretty sure the number of graduate students increased after the “Great Recession”, about the time when I was finishing my bachelors degree and all of a sudden many of my classmates’ seemingly guaranteed jobs disappeared. This puts a lot of stress on the peer review system. Scientists are not paid to review research for journals, and reviewing may or may not be included as a performance metric in their evaluations (if it is, it’s certainly not as important as publishing or teaching). With more and more papers being submitted more and more reviews are needed. That cuts time out of, you guessed it, doing their own research. It’s a problem lots of people talk about. Others lament that with so many papers out there, it’s getting harder and harder to find the one you need. Science is swamped with papers. Even without publishing in a journal, there are other ways to find data. For instance, masters theses and PhD dissertations are often published online by their institutions, even if the individual chapters never make it into a peer-reviewed journal (perhaps because the student leaves science and has no motivation to go through the grueling publication process). But this type of literature can be harder to find, and is not indexed in Web of Knowledge, for example. So if it’s the data or methods you need, you might not find it. I’m not particularly convinced by the argument that there’s too much science out there. Research is still filtered by journal quality. Personally, I read journal tables of contents for the best and most relevant journals in my field. I also have google scholar alerts set for a few topics relevant to my research, so that when someone publishes something in a place that would be harder to find I know about it. This has been useful. I’m glad they published it, even if it’s in an obscure place. With that in mind, I wonder if there is a way to publish datasets with a methods description and some metadata but without having to write a full paper. There are, of course, many online data repositories. But I don’t believe people use them for this purpose as much as they could. It is now becoming common for journals to require that data be archived when a paper is published, so much of the data in these repositories is simply data that actually already has been published. In other cases people only bother with publishing a dataset as-is if it is large or has taken a lot of time to curate, and might be of particular interest and use to the community. Smaller datasets of pilot projects or null results are not often given the same treatment. And while published datasets are searchable within the individual repositories archives, they don’t show up in the most common literature search tools, because they aren’t literature: they are just data. Is there a way that we could integrate the two? If you have five papers-worth of data that you don’t think you’ll ever publish, why can’t we have a data repository system which includes a robust methods and metadata section, but skips the other parts of a traditional manuscript? If this were searchable like other kinds of literature, it could contribute to more accurate meta-analyses and a faster advancement of science, because people would be able to see what had been done before, whether it “worked” and was published with high impact or not. The peer review process could also be minimal and, as with code or already existing data archives, these data papers could have DOI’s and be citable. But I’m not sure if this is realistic (and honestly, I haven’t thought through the specifics!). Science seems slow to change in a lot of ways. Methods change fast. Open access and online-only publishing have swept through to success. But creative ideas like post-publication review, preprints, and other innovations have been slower to catch on. These types of ideas tend to generate a group of fierce supporters, but to have a difficult time really permeating the scientific “mainstream”. The scientific community is big – how can we change the culture to prevent our large and growing file drawers full of unpublished results from biasing the literature? Stay tuned for part two of this series, about other reasons that people are pressured not to publish results – for instance, internal or external politics, competing hypotheses, stolen data. Part two will be published later this week. If you want to take the survey before it goes up, click here.